The Express credit card has long been a top choice among those with a taste for fashionable, more affordable clothes that look great at work or during a night out on the town. Those who frequent the store have probably been asked at least once about whether or not they’d like to sign up for the Express Next credit card for use with their purchase. Hesitant to open a new card without fully understanding the pros and cons of how it works, many people simply decline. The real question is: Was declining the Express Next credit card a good idea? With several important perks, and only a few drawbacks, many might actually take the cashier’s offer of credit next time they visit one of the company’s traditional or factory stores. 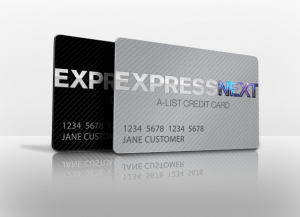 The Express Next credit card is named for the Express Next rewards program. Members of the plain rewards program get 5 points per dollar that they spend at the store or online, and they can use these points for an Express gift card once they accumulate at least 2,500 of them. That equates to $500 of Express apparel per year, since the points expire every 365 days. Express Next credit card holders triple the points per dollar, and earn 15 points. That means they get a $10 reward card after every $167 of purchases, which isn’t hard to do at this store. Credit card holders need to earn 7500 rewards points to be classified as A-List for a full year. Members of this elite group get an extra 5 points per dollar spent in the store or online, and they earn a $15 reward card after 2,500 points. That’s an extra $5 with less spending, which is a pretty exciting benefit. Express Next card members receive exclusive details via mail or email, including special savings on each purchase or limited-time, member-only sales events in stores for reduced prices on popular apparel items. They also receive extra opportunities to earn reward points by leaving product reviews, sharing Express Next card applications with friends, and more. Each Express Next card member receives a birthday gift each year valued at between $10 and $50 depending on reward tiers. There are certainly more advantages to this card than negative factors, but it’s worth pointing out the few things that the credit card lacks or areas where it misses the mark. Those considering the credit card should be wary of these negatives if they do decide to accept the offer and apply for credit at checkout next time. Express does not differentiate its APR for customers based on the strength of their credit profile, and applies the same high rate to all those who are approved. Currently, the Express credit card’s interest rate stands at 24.99 percent. This is not a problem for customers who merely use the card to earn extra points and pay in full, but those who carry a balance will feel the sting of this APR on their very first statement. Many new customers report receiving a credit limit of just $250, $500, or $750. Given the going rate for apparel at Express, this limit might not go very far on an extended shopping day in-store or online. Despite its few drawbacks, the Express credit card is an excellent way for frequent shoppers to triple their rewards points, earn excellent gift cards and special rebates, and maximize their savings with special deals or exclusive events. For this reason, those who don’t mind higher APRs or lower starting limits and frequently shop at Express anyway would benefit from using the Express credit card.